Friend 2: To scream His glory... perhaps among other things? Sometimes I miss being involved in the kind of church/culture/family I grew up in. This kind of conversation, and a community mindset that every conversation is also a theological conversation is something I don't have right now, and something that I dearly miss. 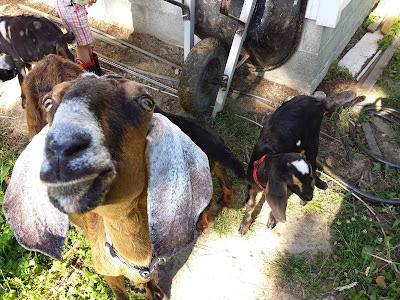 Today, I buried our goat Rosemary, who was the matriarch of the herd, and a very sweet, productive, and steady animal. I'm not sure how old she was, since we got her from a family that Liz grew up with (who had taught her how to keep dairy goats). Our herd became infected with coccidiosis, a particularly nasty gut parasite for goats and other cud-chewing animals. It started with two of the kids, and spread. Once we figured out what it was, we treated them for it, and did our best to keep them eating, hydrated, electrolyted*, and free of other parasites, but thus far it has reduced our herd from eight to four. Lord, what is Rosemary's death for? My mind thought of many things, but all of them ended up being a form of that same answer. Of course in the end, everything is for God's glory, but perhaps this situation makes it a bit easier to see, since from an earthly "under the sun" perspective, it seems so senseless. Rosemary's death did about as much direct good as Saturn had an effect on your daily commute. Since the earthly purpose is unsatisfactory, we are more willing to look for divine purpose. So, why do animals die? In particular, why do the animals that serve us, that we love, have to die? When we lose something that we love, we suffer, but the suffering that we endure in this life (and also all of the suffering of all of the creatures) is worth going through in order to achieve the final result that God has in mind. Hence the analogy to childbirth. This applies to our little situation, but it also applies on the grand scale. When God created the world, including the animals, according to this passage, He made it subject to entropy. Animals die. Plants die. Stars explode or burn out. Left to its laws as we understand them, the universe will either collapse back in on itself, or (more likely) expand itself into a frozen waste. And at every stage in its creation, God called it good. From the passage in Romans, the whole creation is waiting, in its entropic spiral, for the true consummation of our adoption as sons and daughters of God. When that happens, the whole creation will become subject to a new order. Where the old order steadily breaks down, the new order is ever-expanding and bursting at the seams with life. Where the old order would lead one to despair, the new order inspires hopeful expectation. Both of these passages focus our attention on Christ, by whose sinless death we are cleansed from our sin and declared worthy to be God's children, and by whose resurrected life we will, with Him, bring glory and incorruptibility to this universe, just as it has been brought to us! Both passages encourage us, in view of Christ's certain victory, to not be discouraged by the death, destruction, and futility we see now, but to take actions that are consistent with the expectation that the old order and its trappings will be swept away when Christ is revealed for who He is. Before the Sun shines forth in majesty. Whose love has cheered us through the darksome night! Whose faintest whispers make our souls rejoice! No thorns to wound, no toil to mar our rest. What will the sunshine of His glory prove? What the unmingled fullness of His love? What hallelujahs will His presence raise? What but one loud, eternal burst of praise? I'm glad you asked the question of God. He is faithful to dialog with us. I too had a long conversation. I believe that he extended her life, such that it looked like a miraculous turn around, because of the plea of my heart. I was then so much more disappointed that He would have her recover just to see her slip away. I found myself questioning why He would give me such hope and then still have her succumb. His gentle reply was that He once again just wanted to show me His heart to grant my plea while His perfect will is still going to be done. Like we moms and dads will many times extend a child's bedtime (one of a zillion examples) because of their heartfelt plea and childlike reasoning in spite of knowing the outcome will still be the same. More and more I see analogies with spouse and children to God's ways. It seems so natural to give in to our child's or even spouse's reasoning when we know there is a better and higher choice. Even when we know the consequences are not going to be as pleasant as they imagine them to be. If we who know how much we care for ours can do that why should we be surprised how God would hear the pleas of our hearts. Yet, when I see that He has had things under control all along, and He did lead us to recognize what was happening and to 'doctor' them in the best way possible; my higher calling is to continue to pray for His will, His wisdom for me and others to be guided by His will. He has been faithful to bring amazing things to light so our journey was more successful than it might have been. I enjoy being actively lead, guided and inspired by His wisdom and to respond in a timely way with my energy, time devoted to study, my love toward Him and His creation. Tim, your references from scripture shed beautiful light on this incident and is most inspiring. I so respect your devotion and so does your father-in-law.